Designing an event takes vision and, quite often, lots of fabric to transform a space from meh to marvellous! Event tables, especially, have the important task of carrying through theme and colour. For Kendra Bui of Linen Closet, creating statement tables, whether casual or luxe, is all a matter of staying abreast of trends and working with a wide choice of quality fabrics. Heading into its seventh season, Bui’s boutique linen rental firm specializes in soft table wares, from chair covers and napkins to pillows, table runners and table cloths. The company dresses many a Toronto event and is the go-to stylist and linen provider for interior design and wedding magazine photo shoots. Linen Closet’s in-house design team stitches and customizes all of its collections — there are 20 of them — using quality fabrics sourced from around the world. Planners can browse, request samples and order linens online, or they can see and touch the wonder world of colours and textiles on display in the company’s Richmond Hill, ON showroom. 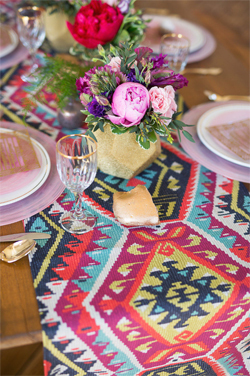 So what’s trending for table linens in 2019, according to Bui? Tactile fabrics, from natural yarns to plush velvets, for added sensory and visual depth. Sequined fabrics continue in popularity, injecting a touch of sparkle where least expected. Bright, bold hues will pop from tables for instant Instagrammability.